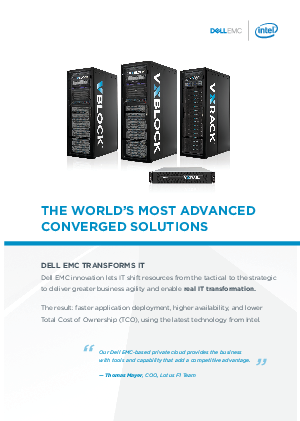 Dell EMC is the world market leader in converged infrastructure solutions. Through Dell EMC Converged Infrastructure and Solutions Dell EMC accelerates the adoption of converged infrastructure and cloud-based computing models that reduce IT costs while improving time to market. Dell EMC along with Intel® deliver the industry’s only fully integrated and virtualized cloud infrastructure systems, allowing customers to focus on business innovation instead of integrating, validating, and managing IT infrastructure. These solutions are available through an extensive partner network.